I became passionately interested in botany and nature conservation in secondary school. In the beginning, my contribution to spreading the idea of living in harmony with nature was to design urban green spaces and related to this, to educate residents to increase their awareness about the environment through contact with nature. This is why I graduated with a degree in landscape architecture. After my studies, I began working with the Naturalists' Club, where I found an excellent place to develop my greatest passion - the protection of xerothermic grasslands. The LIFE+ project is the second I have implemented for this purpose. I believe that environmental protection must go hand in hand with science, and for this reason we are simultaneously working with Warsaw University on studying the causes, tempo and effects of xerothermic grassland degeneration in the lower Oder River valley. Additionally, I am a member of the EDGG. I grew up and live in the Mieszkowice Township along the Oder River. I have been keenly interested in nature since childhood, when I caught and preserved (unfortunately) butterflies and kept an aquarium. 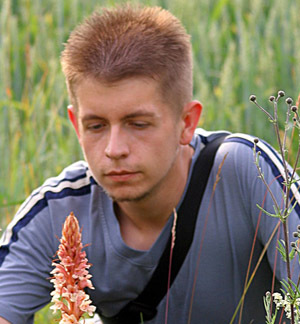 During the later years of elementary school, in high school and university (major in biology and environmental protection at Szczecin University), I concentrated on botany and ornithology. I learned about and became enamored of xerothermic grasslands by accident while collecting data for my master's thesis (the flora of part of the Oder River valley), when a record flood at the time "pushed" me up the Oder valley escarpment. After university, I worked in a school for 10 years as an environmental educator in its broadest sense, working with youth to discover, test and protect the natural treasures of our region. For several years now I have been conducting nature inventories and monitoring (I am a typical field worker), and I also work as a volunteer. I come from a small town near the picturesque Działów Grabowickich area that is a meso-region of the Lublin Upland. I was educated as a biologist, actually a botanist, and being a naturalist is my passion, but that is a big word. After completing my master's thesis on the phytoplankton of eutrophic ponds, I "transitioned to land" and started to soak up the sun when I began working with the vascular plants of xerothermic habitats. And this is where I ended up. Currently, I unravel the "mysteries" of xerothermic grasslands in the Lublin region while marveling at the wisdom and beauty of the Created world. I live in Tomaszów Lubelski. Xerothermic grasslands and nature photography have been my main interests over the past seven years. I authored several papers in the field of botany and had several photography exhibits in Lublin, Zamość, Zwierzyniec and Tomaszów Lubelski, among others. 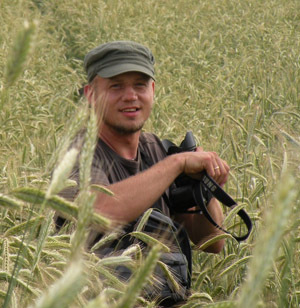 I am also a member of the Zamojski Nature Society, the Voivodeship Team of Specialists for the Natura 2000 network and European Dry Grassland Group (EDGG). I have an ongoing working relationship with the scientists at Marie Curie-Skłodowska University in Lublin and the Jan Kochanowski Humanities and Natural Sciences University in Kielce, as well as with the Society for Nature and Humanity of Lublin and the Naturalists' Club of Świebodzin. I came from Torzym - small town placed in the Lubuski Region (W Poland). I graduated from at Adam Mickiewicz University in Poznań and specialized in environmental biology. My interests in nature had started in childhood when I was especially interested in birds. As a consequence, in similar way to many other naturalists I started as an ornithologist, however in further years I changed my main interests to xerothermic grasslands and peat bogs. I started working in the Naturalists Club just after I left the University. I was born and live in Warsaw, where I also studied at Warsaw University's Inter-Faculty Studies in Mathematics and Natural Sciences. 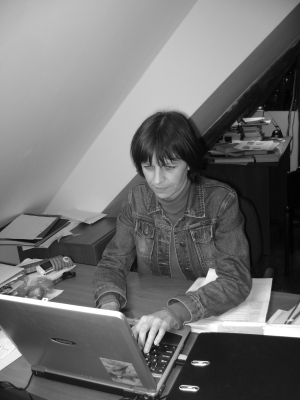 Since 2006, I am a doctoral student at the Museum and Institute of Zoology of the Polish Academy of Sciences in Warsaw. My dissertation is on the influence of natural and anthropogenic disturbances to the forest structure on avifauna. But I'm not an ornithologist; I am interested in many problems related to ecology and am equally willing to work on invertebrates or plants as on birds. I am especially interested in topics related to forest disturbances and the ephemeral populations of non-forest species related to this, the problem of choosing places to protect (or answers to the question: where best to establish a reserve?) and the functioning of populations after the environment has been fragmented (meta-populations, meta-assemblages). I am also very interested in methodological issues related to the effectiveness of making natural inventories and the statistical analysis of the data that follows. I graduated in biology. I defended my Msc thesis entitled "Usage of air photographs for investigations on terrain topography - habitat use relationships: "Promno" Landscape Park as a case study" in Adam Mickiewicz University in Poznań. I have been connected with the Naturalists Club for many years, formerly as a volunteer, next as a permanent employee. The Club is a social association conducting activities to protect nature and educate society about the environment. It was established in 1983, but officially registered in 1989. The Club is mainly active in western Poland with its headquarters in Świebodzin, but many activities and initiatives are conducted throughout the entire country. The Club currently has over 400 members. The Club's main activities are focused on nature preservation and environmental education. During its existence, the Club has implemented several dozen large projects, mainly to preserve natural habitats, such as: xerothermic grasslands along the Oder, Warta and Noteć Rivers, peat-bogs in Pomerania and forest ecosystems of the Drawska Forest. It also implemented projects to protect rare animal and plant species, including the European pond terrapin Emys orbicularis and Smooth snake Coronella austriaca. 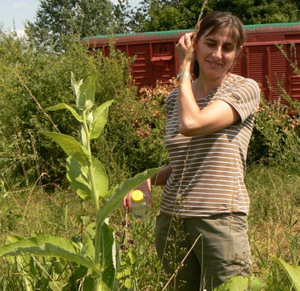 The Club also conducted projects to minimize conflicts between humans and beavers and to preserve old fruit tree varieties (the Field Station in Owczary has a collection of old fruit tree varieties to preserve this stock) and disappearing weed species. The Club currently operates several projects. In addition to the LIFE+ project to protect xerothermic grasslands, these include "The program to protect alkaline fens and associated, threatened plant species", "Active protection of snails listed in Annex II of the Habitats Directive: Narrow-mouthed Vertigo angustior and Desmoulin's Vertigo moulinsiana whorl snails", second stage of the project "Comprehensive protection of the Puszcza Drawska peat bogs", "Continuation of the protection of xerothermic grasslands in the Oder and Warta River valleys". The Environmental Protection Workshop functioning as part of the Club maintains an inventory of natural resources, produces project documents and protection plans for reserves, landscape parks and other types of areas. It also provides various types of expert reports and opinions on topics related to nature. Other environmental protection activities conducted by the Club include the purchase of land and creation of "private" nature reserves. The first such reserve was established in 1994 and includes unique xerothermic grasslands in the vicinity of Owczary. Currently, the Club owns, leases or uses land with a total area of over 130 ha. Each year, the Club organizes several dozen educational conferences, workshops as well as national academic sessions on topics related to various aspects of protecting nature. As part of its educational activities, the Club has a permanent exhibit at the Meadow Museum (Muzeum Łąki) in Owczary near Górczyca. This is also where the Club's Field Station was established 12 years ago. Since 2008, a second station was established in Uniemyśl, the Naturalists' Club Sudecka Field Station (www.karczma-uniemysl.pl). The Club's educational activities also include trips, camps and contests for children and youth, as well as publications, including several dozen books published annually. More information about the Naturalists' Club can be found at www.kp.org.pl. 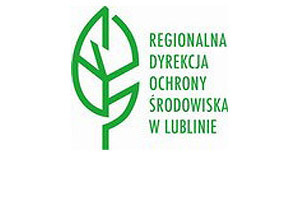 RDEP in Lublin is an independent office of the central government's administration for the Lublin region, established by the Law of October 3, 2008 on accessing information about the environment and its protection, involvement of society in environmental protection and assessment of the impact of actions on the environment (Journal of Laws No. 199, position 1227). 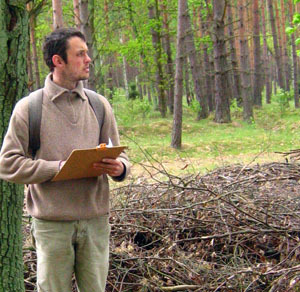 The Directorate implements tasks in the area of nature protection (including the management of Natura 2000 sites), assesses the impact of activities on the environment, undertakes preventive measures to protect the environment, and also implements the eco-management system and EMAS audits. The Directorate works with academic institutions, non-governmental organizations, local government offices and local community residents in the field of nature protection. It implements and participates in nature protection projects, training workshops, conferences, exhibits and other activities related to environmental protection. More information about the Directorate is available at www.lublin.rdos.gov.pl.